AVAILABILITY: In stock, generally ships in 2-3 weeks. This personalized crock is a unique and memorable way to display a couple’s marriage, anniversary, housewarming or other life celebration moment. 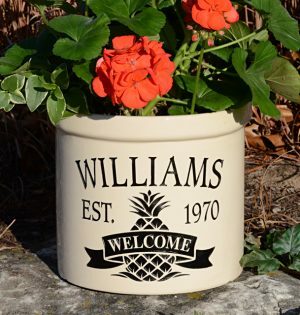 Our personalized stoneware crocks are a generous 2 gallon size, 9.75″ diameter, and 9″ high. Select from several designs, each of which will add style and personality to any home. They are highly durable and may be used as a house marker or planter for your entryway or as a decorative accent to your hearth. How you use your personalized stoneware crocks is up to you–kitchen utensils, ice bucket, container for magazines-newspapers, endless possibilities. Perfect for a wedding gift, anniversary, or housewarming gift. Each personalized stoneware crock is handcrafted from premium Tennessee clay and weighs a sturdy 12 pounds. The crocks are finished with a lead free glaze. The personalization is deeply carved and painted in your choice of four different weather resistant finishes. Pineapple Welcome Stoneware Crock – Name/EST.